Salvia microphylla ‘Rodbaston Red’ is a member of the Labiatae family and can be found in the Trials Garden. Salvia microphylla ‘Rodbaston Red’ is a very prolific flowerer, from summer to the first frosts. Its bright pink red flowers open on a daily basis, and they are beloved by bees. It grows to about 1 metre high and 1 metre across, has square stems and small mid green leaves that can feel sticky to the touch, due to oil glands on the leaves. This oily secretion gives rise to the strong aroma associated with most salvias. This salvia is not reliably hardy in the West Midlands, so, at this time of year we take cuttings as a safeguard. 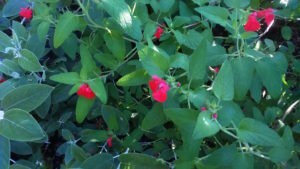 All salvias like growing in a warm sunny spot, in well drained soil. In the Trials Garden you can see several more salvias, for example, S. confertiflora and S. uglinosa.